Wow, seriously what is up with this month? Two weeks ago I went to get out of bed and slammed the bottom of my foot into the metal bed frame. I had a huge bruise and couldn’t walk properly for a week. I can still feel the injury a bit when I put weight on it. On a less clumsy note, your music is awesome! I generally don't bother to look up composers after playing a game, but Zombies On Your Lawn was so catchy. ^_^ Do you have any compilation soundtracks for sale on CD? Either way, please keep up the excellent work! Messes sound better in descriptive storytelling. Mine always relate to waterworks (kitchen, bathroom, etc.). …is the zombie temp agency hiring? 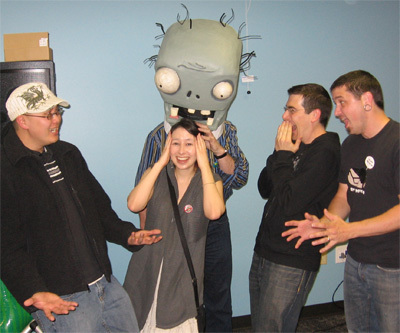 Hahaha, the zombie temp agency is always hiring! Water-related clumsy stories are always very funny I’ve found… in one of our old apartments, the ceiling above the shower caved in on my roommate while they were showering… it was pretty awesome… lots of angry shouts coming from the bathroom that day. Haha, you’re such a cutie shigi. I don’t think I’m any more clumsy this month, but my friend sprained her wrist playing tennis and spilled a glass of milk all over my electric bill. She’s not normally like that… does that count? Hello Shigi! Hima’s here 😀 Haven’t talked to you for like forever! How’s your game going? Hima! Yay, I haven’t talked with you in such a long time… how are your games coming along? As you can see I got sidetracked from finishing “Far Away from Here” but I’m definitely still working on it… and I’d still love to work with you on the art-part of it as soon as it’s finished 🙂 Haha, that’s cool to hear that your professor is addicted to PvZ, I’m glad they’re enjoying it. My game’s coming along pretty well… so much work to do still, but I’m learning a lot 🙂 Anyways, thanks for stopping by! Awwww. 😦 I’m sorry that you had a clumsy month. Somewhere, out there, there is a little one year old that loves your song and zombies. You’re not the only one with a clumsy month 😉 Not only did my hand momentarily forget how to grip a plastic cup of water in the office – cue me looking down in puzzlement at the kitchen floor at a spreading pool of water – but also successfully tripped over the ball while playing 5-a-side and skidded along the astroturf on my arms. I wonder whether it’s possible to have a month-long full moon? Oh, and thanks for that link, Alevan. That made my day! Laura, your work is brilliant, you’re exceptionally talented. I fell in love with your music in PvZ, I wish you’ll be working with PopCap in their upcoming titles. You and your friends are not the only ones out there, Shigi. I’ve been clumsy for as long as I remembered. Haha, that’ll definitely do it to ya 🙂 I remember having clumsy stints after pulling all-nighters in school. #1 – Well, I had to parallel park in someplace, downtown Los Angeles, and there was about 20 feet of space to park in. So the parking should’ve been simple! But I didn’t see the weird little obstacle that was on the driveway, it was a block, (literally, a cube about 4 feet tall and 4 feet wide, made of cement) just sitting there, on the street. Well, I didn’t see it as I passed it, and then I didn’t see it on my back mirror while I was parking and pulling reverse. (the block was short, so my back mirror didn’t catch it) and I slowly bumped into it. There was no serious damage, just a permanent little scratch to my car and a tingling sensation to my pride. Oh no! I used to live in an area where it was fairly easy to get parking tickets as well… that sounds really frustrating! Hey fantastic job on Leeble forest!, do you know when part 2 will be out? i played all the way through it and definitely would love to continue the adventure. I think you did an awesome job on the game so far– it really has that old role playing / old final fantasy feel which is the best!. Hawk reminds me of Setzer from final fantasy – a real free spirited and sketchy but faithful person hehe. Anyways take care– and nice job on the music with both Leeble forest and PvZ. Oh, thank-you for taking the time to play the demo! I’m so happy you enjoyed it 🙂 I’m glad that Hawk’s personality comes across in the demo… I did intend for him to be sketchy on the outside, but with a good heart on the inside. I’m hoping to release one more demo before the game is completed… perhaps sometime in the next couple of months. Hopefully you wont mind additional praise on your work in PvZ? I’ve never fallen in love with a game soundtrack quite like I have with that one. The style is so unique, but the sound is so wonderful! I want to download the rest of it, but your google page keeps having its bandwidth exceeded! If I could buy it on iTunes, I would! I’m really excited to hear what you make next! I hope you keep a partnership with Popcap. You both seem to benefitting a lot from the music featured in PvZ. Thank-you very much ^_^ Sorry about the googlepages thing… it’s been experiencing too much traffic, so I’m trying to move my stuff to another site. I’ll definitely update though if I release any new material! GREAT GAME AND GREAT JOB! Wow, that’s awesome! I’ll let George and the team know that you enjoyed it. Thank-you for your comment!